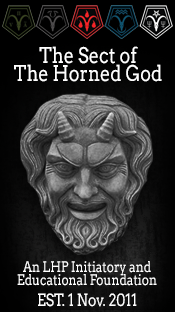 This essay marks my two hundredth for The Sect of the Horned God, and as such, I felt I should at least recognize the number, if not the process by which it was attained. I suppose that it seems that I am always writing something to most people, so the idea that I should have 200 essays probably doesn’t surprise anyone, especially in light of the multitude of posts I also make in response and recognition of those who feel moved to respond to my efforts, or as I support and comment on the efforts of others here on the Sect’s pages. Indeed, I have been writing here or elsewhere on the web or (gasp) before there was a web to write on, when the limitation to one’s output of literary diarrhea was only hampered by the lack of paper, a typewriter or typewriter ribbon. How many pages I’ve penned in the past 50 years is beyond me. I’m sure I’m responsible for the death of a small stand of trees in Oregon, at least. So then, what is the Mr. Ed school of thought? It comes from the theme song of the show. And by now, you probably think that after 200 essays, maybe I have a little too much to say and should just go sit in my corner with my iced tea. Over my years here with The Sect of the Horned God, I hope I haven’t bored you too much or too often with my musings, reminiscences and thoughts on various subjects. I hope that some of what I might have had to say might have held meaning for a few. 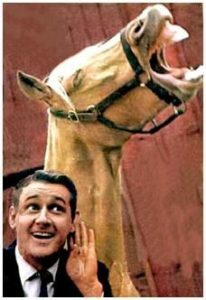 I’ll try to keep Mr. Ed in mind as I write more in the future and speak when I have something to say, and not waste your time.